The European Space Agency’s (ESA) Rosetta has reached its target -- the Comet 67p/Churyumov-Gerasimenko -- becoming the first spacecraft in history to rendezvous with a comet. And in November, it will accomplish another first when it drops a small probe, Philae, to a soft landing on the comet’s surface! Churyumov-Gerasimenko, along with its new tagalong companion Rosetta, is presently moving toward the inner solar system and will reach perihelion (closest approach to the sun) in August 2015. Rosetta’s mission is to make a detailed study of the comet’s structure, composition and the effects of increasing solar heating as it warms up. A comprehensive campaign of observation with its array of instruments will offer us unprecedented insights into the conditions in which the comet formed in the earliest annals of the young solar system, as well as the evolutionary path it has taken since. Even as Rosetta made its gradual approach to the comet during the summer, it began to detect some unusual -- and in some cases unexpected -- characteristics. For one, the comet’s shape; generic preconceptions for the comet’s structure and surface appearance were “typical”: a roughly round, mountain-sized blob of ice with some bumps, a jagged edge here and there and maybe some surface cratering. We haven’t seen many comets up close, so expectations must be based on a handful of examples. But Churyumov-Gerasimenko, like its name, has a double-lobed structure, looking a lot like two comets that have been fused together and connected by a bridge-like neck (perhaps each lobe can be named for one of the co-discoverers.) Whether this comet is a “contact binary” (two comets that joined together) or was a single comet whose shape has been sculpted by the vaporizing chisel of sunlight over eons is yet to be determined. The comet is also warmer than expected: a balmy negative 90 degrees Fahrenheit. Sounds pretty cold, but calculations based on the comet’s distance from the sun and the reflectivity of water ice predicted that it would be colder. A likely explanation is that the comet’s surface is coated with dust, making it darker and more able to absorb the heat in sunlight -- not unlike how a dark t-shirt warms you up more than a light-colored one. 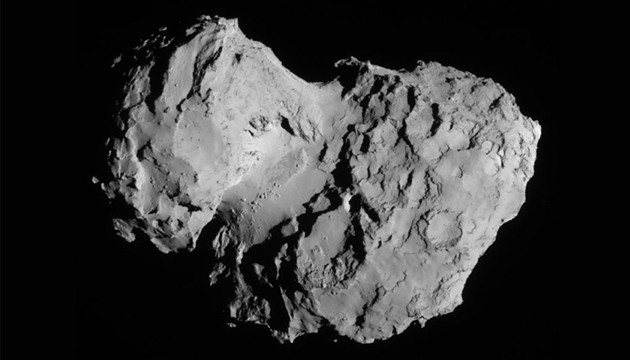 The average density of this comet is only one-tenth that of water ice, so a sample of its material would be light, airy and as feather-weight as powder snow. In other words, an ice cube tray amount of material from the comet would weigh as much as a single solid ice cube. Attempting this first-of-its-kind mission to orbit a comet required a first-of-its-kind maneuvering tactic. Only about two miles across and weighing a mere three billion tons, the comet’s gravity is incredibly feeble. If you were standing on its surface, it would take little more than a light hop to break free of the comet’s gravity and propel yourself into space. So the ESA operators of Rosetta have been maneuvering the spacecraft through a series of thrust impulses designed to drive it around and ever closer to the comet in calculated bursts. This “powered orbit” maneuver -- a lurching, rocket-driven zig-zag in the space surrounding the comet -- reminds me of the one (and only) time I went bungee jumping. After I had stopped bouncing at the end of the bungee, they sent a powerboat out to grab me with a long, hand-operated hook. As I swung about over the river, the boat driver had to gun the engine, turn the boat in bursts and fight with the river’s current while trying to get close enough to hook me. As Rosetta circles and closes in on the comet, it is also mapping the entire surface from every direction looking for the best landing site for its drop-probe: Philae. The preferred landing sites are flat areas that offer the best chance for Philae to land upright, but investigators also want to send it to the most scientifically interesting place -- for instance, at the site where one of the comet’s gas plumes might emerge from as it heats up and becomes more active. Ultimately, Rosetta will move to within about twenty miles -- and possibly closer -- where the comet’s gravity is strong enough (or more accurately, not too feeble) to tether it into a true orbit. Even then the spacecraft’s orbital velocity will be only a few inches per second -- literally an insect’s crawl. Any faster than that, Rosetta would fly off into space again. Past comet encounters by spacecraft -- Deep Impact/EPOXI, Giotto, Stardust and a handful of others -- have been fly-bys with only brief hours in which to examine their targets before flying off into space again. Rosetta will fly along with Churyumov-Gerasimenko for the next year, studying the effects of solar heating as it swings through its closest approach to the sun, between the orbits of Earth and Mars and the aftermath as the comet cruises back toward Jupiter’s orbit. Stay tuned. Rosetta only just arrived at its destination, and after the 10-year journey it took to get it there, only now does the adventure really begin.